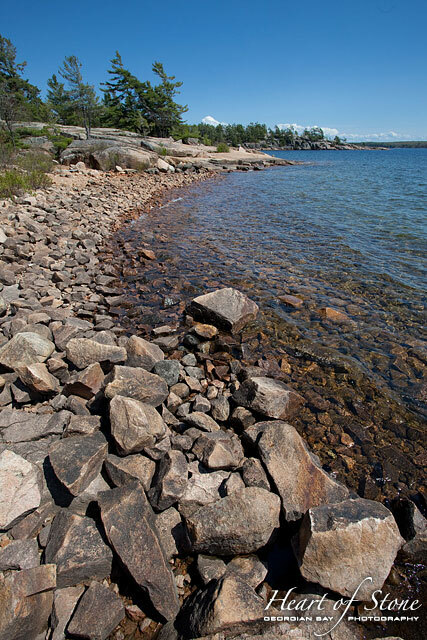 Killbear Provincial Park, a broad peninsula that forms the division between Parry Sound and Georgian Bay proper, is a brilliant jewel set amidst the splendour of the Canadian Shield. Rugged granite outcrops are offset by wide, endless, sandy beaches. 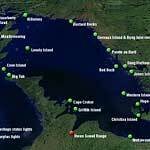 Several trails of varying lengths provide distraction for the adventurous, and a close proximity to places like Jones Island means that good day trips abound. 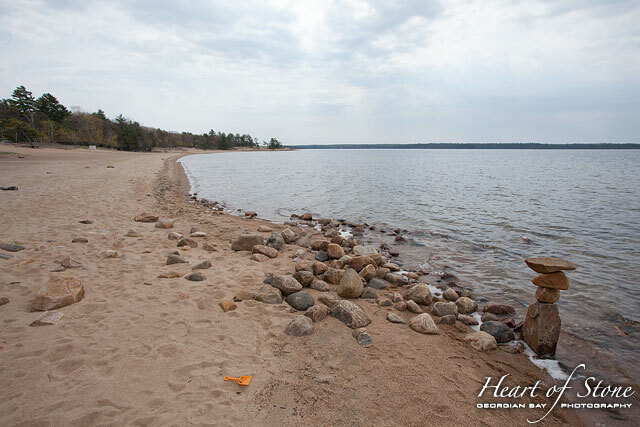 Killbear is a massive, yet well developed, park with nine different campgrounds (see the Killbear Campground Map). Firewood (currently $7/bag) is dry and of high quality, the comfort stations are immaculate with excellent hot water, and almost all outhouses have been replaced with water-fed drop toilets, perfect for those who view porcelain as a necessity. Compared to back-country camping, it’s like a stay at a rugged Holiday Inn. 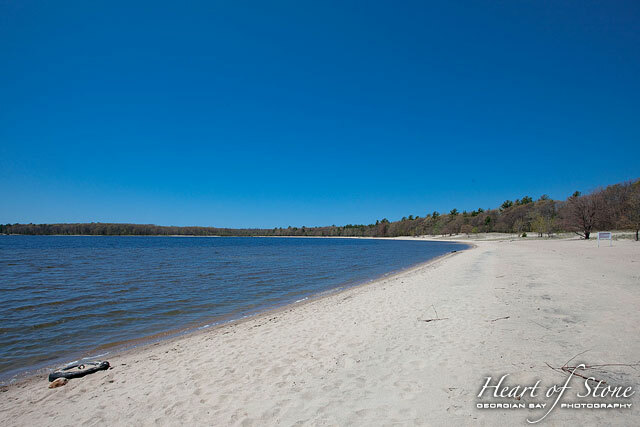 Above, from left to right, solitude in a crowded land: the pristine beaches and rocky shorelines of Killbear Provincial Park lie completely empty in mid-May. For shoulder-season camping, especially with kids ranging from three to eight years old, car camping can’t be beat: weather and bugs are just too unpredictable. The park is open the weekend before the May Twofour, so there’s a narrow window that one can squeeze into before the crowds start to show up from the GTA and beyond. This particular May weekend turned out to be relatively warm, sunny, bug-free, with brilliant starry nights and warm evenings around the campfire. The park was almost completely empty, and the drive along the 400 completely effortless. The solitude, in a park designed to hold thousands, was miraculous. Keep in mind, though, that interpretive programs haven’t started up yet, so you’re on your own to keep everybody entertained. Even the swimming markers haven’t made it into the water, leaving the already empty beaches feeling oddly naked. And there’s an alcohol ban leading up to and including the May Twofour, so you can be assured of a quiet time before the summer-long party that is Killbear starts up. Just don’t expect that single malt to keep you warm at night. Above, from left to right, friends and enemies: a raccoon peers down from a tree, waiting for another chance to steal something, and a deer browses through a campground, keeping a wary distance from the human visitors. 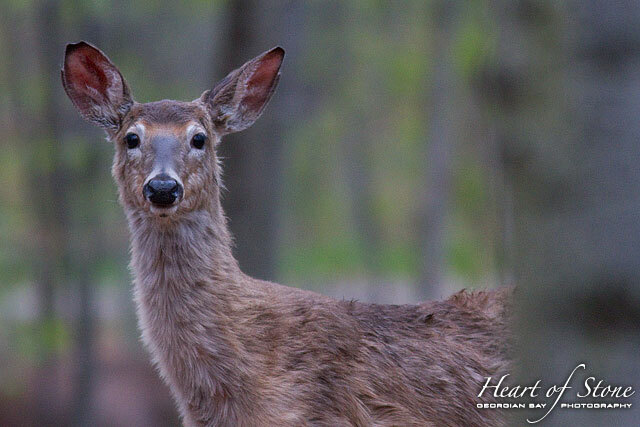 Wildlife at Killbear abounds, and this weekend was no exception. Deer, foxes, Canada geese, merganzer ducks and racoons were plentiful. A baby fox, completely unaware, tumbled over my feet like an uncoordinated puppy. The racoons, unfortunately, were completely out of control after a long winter, and simply couldn’t resist the temptation of human goodies. All night they could be heard rummaging through things left outside, and would be happy to steal a bag of chips off of your lap if you weren’t careful. The raccoons are a real problem, and will get into anything whether there’s food there or not: one destroyed a plastic bin for toys, just to see what was inside. Keeping an immaculate campsite is a must. It’s good advice anyway, since this is bear country. We didn’t see any bears this weekend, but I’ve watched a black bear wreak havoc in Killbear on previous years. Bears are oblivious to human conventions, and will draw a straight line through forest, campsites, and tents if there’s food to be had. 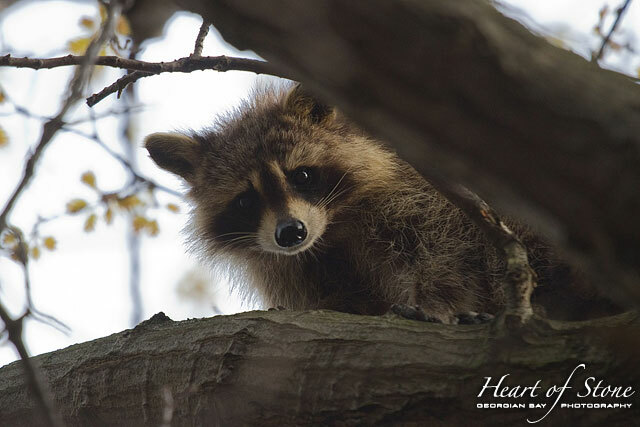 Heed the warnings from park staff, and bear (and raccoon) proof your site. 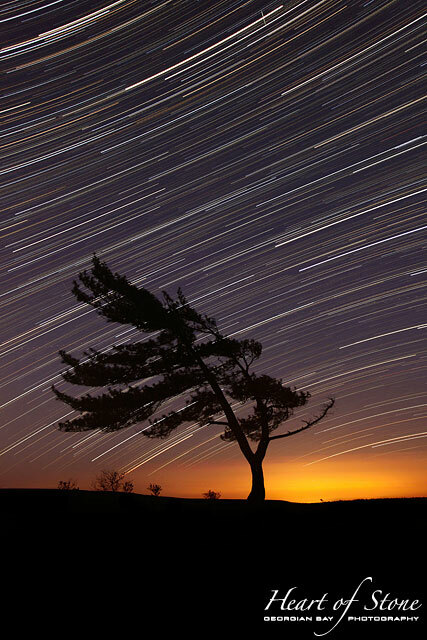 Above, from left to right, seeing the sights: a windswept pine tree frames the celestial equator, the light at Killbear Point, and Scott Island on a calm morning. There’s a lot to see in Killbear, and the shoulder seasons are a great time to do it. 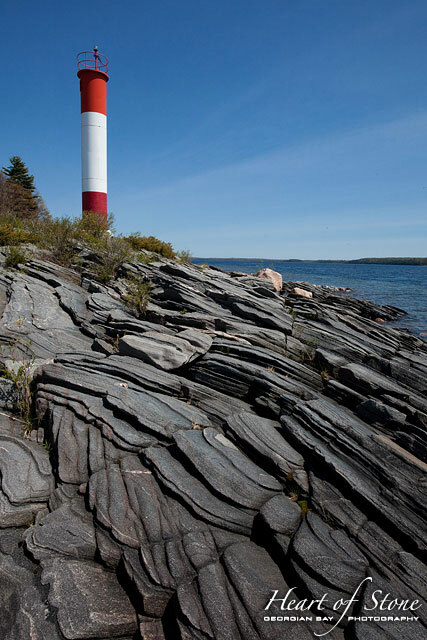 The light at Killbear Point has been granted Heritage Status, so it should remain part of the park (click here to read up on the proposed demise of Georgian Bay lighthouses) for the foreseeable future. 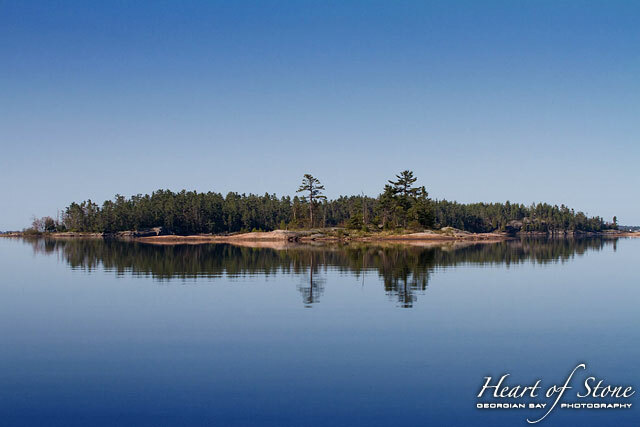 Canoe trips to Scott Island are lovely when the winds are calm, and the famous Killbear pines don’t disappoint. If you’re looking to get away, an early trip to Killbear is a delight. The weather in early May can be a gamble, but play the game right and sometimes you win the prize. An empty park the size of Killbear on a gorgeous weekend is a treat for even the most seasoned camper. This entry was posted on Sunday, May 13th, 2012 at 7:29 pm. It is filed under Trip Reports. You can follow any responses to this entry through the RSS 2.0 feed.